Trendy burger joint coming to Dunwoody. New York-based Shake Shack announced Tuesday that their next Atlanta area restaurant will open at Perimeter Mall in Dunwoody. I have since confirmed that the Shake Shack restaurant will occupy the current Soma space, on the front of the mall. The roughly 3,400 square foot space will be completely renovated and outdoor patio seating will be added. Shake Shack, the trendy burger joint which started as a food cart in New York's Madison Square Park in 2000 and became a permanent restaurant in 2004, has since expanded to nearly 100 locations. The company went public last year, but its stock has come back to earth since its IPO. Shake Shack will open in Dunwoody at a time when there have been more burger joint closures than openings in the area. Fuddrucker's closed its Dunwoody area location on Perimeter Center Parkway in 2010. Cheeseburger in Paradise closed its location in nearby Perimeter Place in 2012. There is reported interest in Burger 21 possibly opening in Sterling Pointe across from the mall, but no other "better burger" joints have thus far committed to the area. By all accounts, Village Burger, which opened in Dunwoody Village in 2010 in a converted Bruster's, remains popular and should be insulated from the chain's opening. A little further away, Farm Burger opened in Georgetown Shopping Center, on Chamblee Dunwoody Road, in 2012 and is by far my favorite burger joint in the area. At Perimeter Mall, Shake Shack joins Varasano's Pizzeria, which opened this past fall and The Cowfish Sushi Burger Bar, which is expected to open April 23rd. 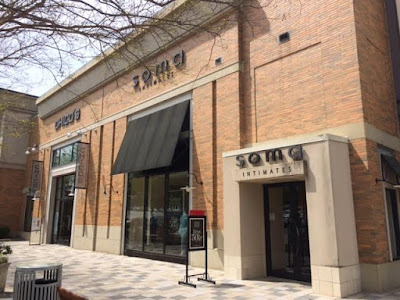 The existing Atlanta location opened in The Shops Buckhead Atlanta in late 2014 and measures 2,500 square feet over two floors. A well placed source indicated to me that plans call for the new Shake Shack to be open in time for this year's holiday shopping season. Are you excited about the opening of Shake Shack at Perimeter Mall? What is your favorite burger joint in Dunwoody? What other restaurant would you like to see opening in Dunwoody? Yet another reason not to go to (The Shops) Buckhead (Atlanta). I prefer Village Burger though it is often crowded. I don't go too often since it isn't the smartest option for one who tries to mostly eat healthy options, but if you cant' indulge once in a while, what is the point? I've never tried Shake Shack and doubt I will unless my wife or a house guest wishes to try it. Despite liking Varasano's Pizzeria, I rarely visit because I just don't enjoy the mall experience. I do disagree with Varasano regarding his view that he surpassed his standard, Patsy's Pizzeria in Harlem, NY, but it is much easier to eat there than fly to NY when I want a good pizza. I am excited to give Shake Shack a try. I've been to Farm Burger a few times and while it's good, I find it pretty expensive. I get the whole "farm to table and organic is more costly," but at that price point, I'd just a soon go somewhere to get a nicer meal than a burger. I'm also not sure how expensive onions could possibly be, but their onion ring portion is a joke. Village Burger is a good local joint if you just want to grab a burger and see your fellow Dunwoody neighbors. While some traditional malls are suffering Perimeter along with Lenox and maybe Phipps are proving if you do it right there’s still a market. But the demographics (goldmine) at Northlake are better suited for Shake Shack !?!? Perimeter mall is probably a good place for shake shack. That's completely about their speed. I prefer all the other better burger places to them, although they are a step above cookout which is on par with McDonalds. On Northlake--Anonymous said (asked I guess)--"But the demographics (goldmine) at Northlake are better suited for Shake Shack !?!?" If you are saying Northlake demographics will in fact support a Shake Shack. 60% of the three-mile market are "tri-iametrecally" different. National scale models using average household incomes there don't provide an accurate picture, so mid to mid plus retailers throw darts blindly there. Total crap shoot. Give the area five years and at least the younger set will CLEARLY support this. Anonymous said ... "Northlake demographics will in fact support a Shake Shack. 60% of the three-mile market are "tri-iametrecally" different." Then CLEARLY you canNOT support this and never will. 5 years and your "tri-iametrecally" pin the tail on the donkey demographics and Northlake will be like Gwinnett Place.